A lot of you probably just got a Roku digital video player for Christmas. You've hooked it up and watched a few films or TV shows on Netflix, maybe you've even subscribed to Hulu Plus. But you're wondering about those 100+ other channels, and which ones are worth watching. To help you venture beyond Netflix, here is my "starter pack" of Roku channels. These are my recommendations on which channels to start off with. Although my own tastes have undoubtedly influenced the channel selections, I've tried to include a variety of subject matter based on ratings and popularity as shown in the Roku channel store, as well as popularity based on page views and searches here on RokuGuide.com. This list is by no means complete and there are a lot of other great channels available. But before adding channels from the Roku channel store, subscribe to the RokuGuide newsletter so you can be notified of new Roku channels and new channel reviews and articles on RokuGuide.com. Amazon Video on Demand. Yes, there are options besides Netflix for recent movies and TV shows. It's true that Netflix offers a great all-you-can-view deal for a good price, but you may not watch enough movies or TV episodes to make a recurring monthly fee worthwhile. Or you might want newer content than Netflix offers. For example, some ecently-released titles that can be streamed through Amazon VOD but not through Netflix include The American with George Clooney, Salt with Angelina Jolie, Wall Street: Money Never Sleeps with Michael Douglas, and Glee Season 1 and Season 2 . 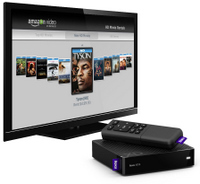 You can search and rent directly from your Roku, or you can do your shopping from Amazon's website and your purchases and rental will show up on your Roku player. Moonlight Movies. If it's older movies you're looking for, Flickstream offers this terrific channel for only $3.00 per year. Moonlight Movies currently has three dozen movies from the 30s, 40s, and 50s. Try before you buy with the Free Movie of the Week. Two free movies are currently offered: Guest in the House (1944) and Dishonored Lady (1947). And if you want even more classic films, look to Flickstream's other channels, which include Cowboy Classics and Drive-In Classics. Pandora. My favorite music source, I listen on my Roku, on my Droid 2, and on my computer. Create your own station by providing Pandora with one or more artists and Pandora will pick similar music. Optionally, give each song a thumbs-up or thumbs-down and Pandora will further tailor your channel to your personal taste. If you link the Roku Pandora channel to your Pandora account, stations that you create on the Pandora website will follow you to your Roku, and vice verse. TuneIn Radio. My second-favorite source of music, TuneIn Radio brings you a multitude of radio stations, many of them Internet-only as well as many traditional broadcast stations. You can select music stations (choose from 22 genres), talk stations (10 genres), or sports stations. The local radio selection brings you nearby stations based on your location, including (for Atlanta anyway) scanner transmissions from local emergency services. You can also select international stations, or pick by language. TuneIn Radio also has a nice selection of podcasts. Roku Newscaster. CBS, NBC, CNN, NASA, ESPN, FOX, C-SPAN, NPR, BBC, and more! If you're looking for news from the major media players, this is the channel to watch. Some of the content is audio only (NPR, of course, but also some CBS shows such as 60 Minutes), but you also get a lot of video. NBC, for example, offers same-day video of Nightly News and the first hour of Today, as well as same-day and four previous days of Jim Cramer's Mad Money. If you just want a quick news fix, CNN offers hour audio news updates. Vimeo. YouTube seems to waste a lot of bandwidth on cute kittens and kids doing stupid stuff. Nothing against kittens or kids, but if you're looking for higher quality user-created videos, then you need to visit Vimeo. Video browsing options are somewhat limited on the Roku. You can search by keyword and you can browse staff and selected HD videos, but setting up account options on Vimeo's website will give you more options for selecting videos and browsing videos tailored to your preferences. Videos that you upload to Vimeo can also be viewed on the Roku in HD. Flickr. If you share or view photos on Flickr, then load this channel and link it to your account. You'll have access to Your Photostream and Your Sets, and you'll also have access to Your Groups. You won't be able to browse any other photos, except those in the Interestingness and Hot Tags categories, but if you join groups that interest you, you will have plenty of photos to view. The biggest thing missing is the option for viewing photos from Your Contacts. CLOC. There are several screensavers out there, but I keep coming back to the simple CLOC. Once you set the option for your location, it will give you temperature, humidity, and barometric pressure in addition to the current time. It's not flashy, but it's practical. Hogoword. Roku isn't just about streaming media, there are also several interactive games. Hogoword is an entertaining an challenging word logic game. When you tire of simply watching or listening to your Roku and you feel the need to stretch your mind a bit, play a round or two of Hogoword. You may have noticed that I haven't mentioned sports. That's because you can find general sports information on a couple of the channels mentioned above. Also, if you're looking for live games, the channel depends on which sport you're looking for. Roku offers Major League Baseball on the MLB.TV channel, National Hockey League on NHL Gamecenter, NBA basketball on NBA Game Time, and several other sports on other channels. Those are my suggestions, but don't limit yourself to these. There are over 130 channels on the Roku, and exploration is a big part of the fun of having a Roku. New channels are added all the time, and I'm sure there are content gems on channels that I didn't cover here. If you think I've missed anything, let other RokuGuide readers know by leaving a comment below. What are your essential Roku channels?